Every child deserves a healthy school that provides nutritious food to eat and opportunities to be physically active. Everyone—policymakers, industry, health advocates, school officials, parents, and community leaders—has a role to play in making schools healthy in communities nationwide. 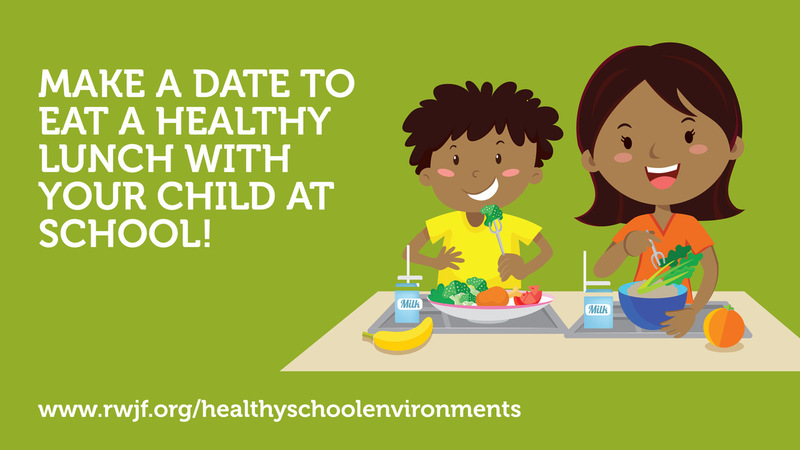 Below you will find graphics, sample social media posts, research, and stories to promote the importance of healthy school foods. Feel free to share the messages and materials in this toolkit on social media, via blogs and newsletters, and at meetings or presentations. A Healthy Eating Research study examining 1.7 million meals served in six schools in an urban Washington school district found that the meals’ overall nutritional quality increased by 29 percent under the updated standards put in place by the Healthy, Hunger-Free Kids Act of 2010. Bridging the Gap surveys of school leaders nationwide revealed widespread student acceptance of the updated standards put in place by the Healthy, Hunger-Free Kids Act of 2010. 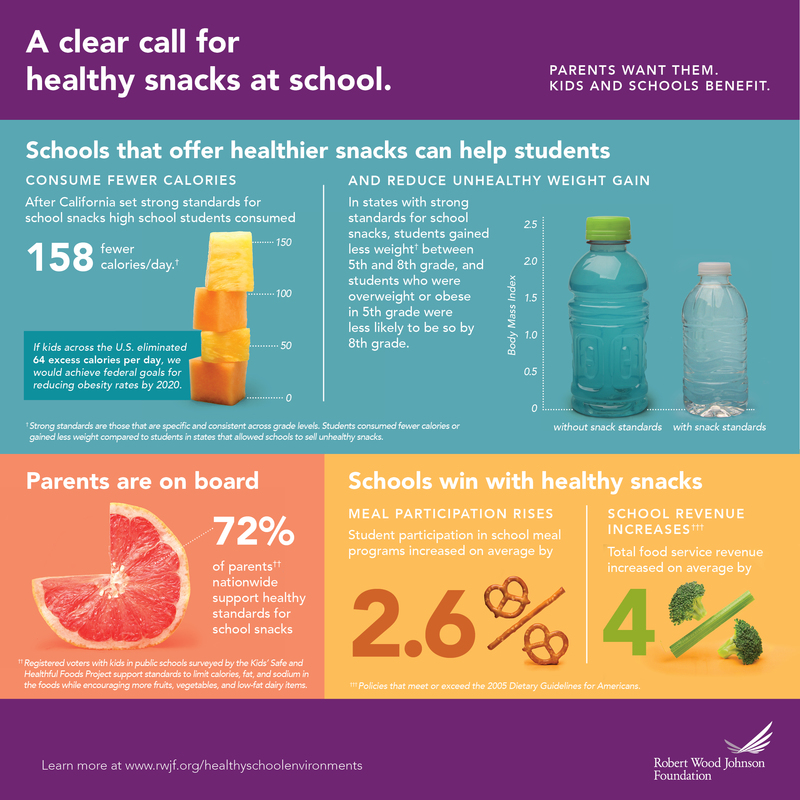 Seventy percent of elementary school leaders reported that students generally like the healthier school lunches; school leaders reported similar results from 70 percent of middle schoolers and 63 percent of high schoolers. A Rudd Center for Food Policy & Obesity study examining 12 middle schools in an urban, low income school district found that more students chose fruit after the updated standards put in place by the Healthy, Hunger-Free Kids Act of 2010 went into effect (66 percent, up from 54 percent) and that students ate more of their vegetables (64 percent, up from 46 percent) and lunch entrees (84 percent, up from 71 percent). A poll released by The Pew Charitable Trusts, the Robert Wood Johnson Foundation, and the American Heart Association found that among registered voter parents with school-age children, more than 70 percent of those surveyed support the updated nutrition standards put in place by the Healthy, Hunger-Free Kids Act of 2010. A study examining low-income, predominantly minority public schools in four New Jersey cities before and after implementation of the updated nutrition standards set by the Healthy, Hunger-Free Kids Act of 2010 found that school lunch participation between 2008 and 2015 rose slightly from 70 percent to 72 percent, while school breakfast participation held steady before rising between 2013 and 2015 from 52 percent to 59 percent. An evaluation of produce consumption before and after a farm to school program was implemented at six schools in a Florida county found that students ate 11 percent more fruit and 37 percent more vegetables after implementation of the farm to school program. A collection of stories and insights from experts about data releases, firsthand accounts about the impact of important policies, and reports from places that have measured a decline in childhood obesity rates. Every day schools around the country are serving up healthy options that kids love. Learn about the people and communities behind these successes and find resources to improve school nutrition from the Alliance for a Healthier Generation. The Kids’ Safe and Healthful Foods Project, a collaboration between the Robert Wood Johnson Foundation and The Pew Charitable Trusts, worked for nearly seven years to provide nonpartisan analysis and evidence-based recommendations on policies that affect the safety and healthfulness of school foods. Find stories of school districts from across the country that implemented various strategies to improve nutrition in their school meals. Voices for Healthy Kids, a joint initiative of the Robert Wood Johnson Foundation and the American Heart Association, shares success stories of schools and communities working to ensure that children have access to healthy food and physical activity. Over the past 15 years, there has been significant progress to prevent obesity and stabilize obesity rates, especially among children. Strong state policies play a key role in improving access to healthy food and increasing physical activity which are essential for promoting a healthy weight. New interactive maps track the status of each state’s efforts on more than two dozen policies aimed at preventing obesity and supporting health in early childhood, schools, and communities. 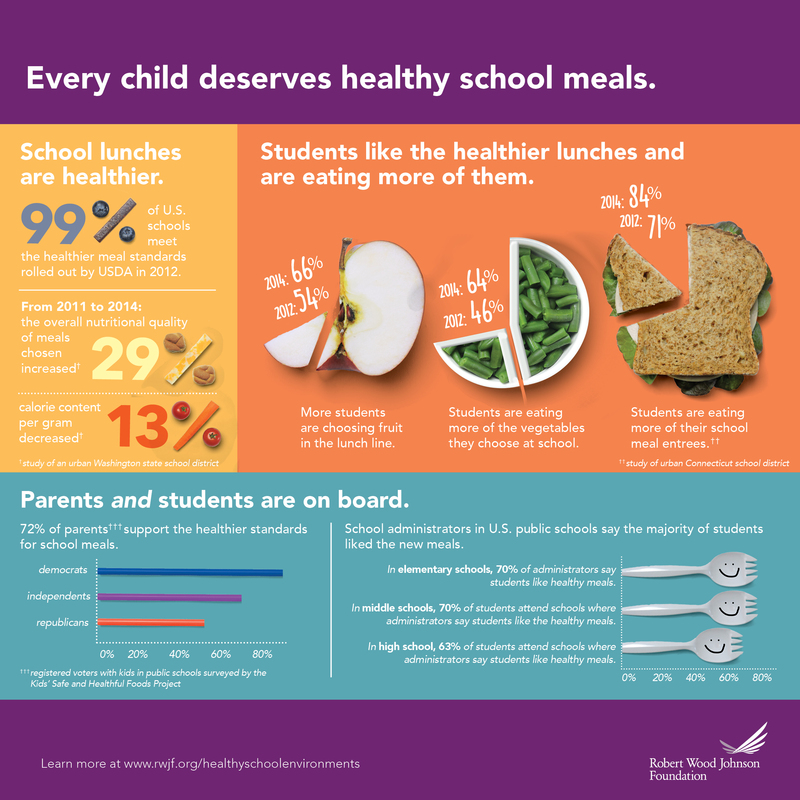 Richard Besser, MD, president and CEO of the Robert Wood Johnson Foundation, shared comments on USDA’s proposed changes to the National School Lunch and School Breakfast Programs, reaffirming RWJF’s support for maintaining healthier school meals standards. The Robert Wood Johnson Foundation hosted A Working Forum on Healthy Schools in 2016 aiming to assess stakeholder alignment on opportunities and barriers to creating healthy school environments and to explore systems-level investments that would support their creation. The Forum also examined levers for promoting equity and sought opportunities to foster school and community collaboration.